lathes.co.uk Has a little info on this make, including the collet types used. There are many other bonding options on the market, Which of those you could use would likely depend on what you were doing and where you are. Is this hatchet hand forged? Is it likely, given the size of the rings that they are cooperage hoops used for setting the staves prior to fitting the barrel bands? Where the found with the axe head? I don't have a photo but it'll be of little use to you anyway, as you equipment will differ. I have a central walkway with a chair at the far end from the door, one side is the forge with the box bellows underneath, on the other side anvil, quench and other sundries, I have no room for tools, fuel or stock and keep it elsewhere only taking what I need for the session. I do have a small gas bottle stove fitted in the corner that I make charcoal in. You may find it usefull to have a removable wall panel by the forge to facilitate extra stock length and you should consider the same for the anvil. You may also wish to consider what can be placed outside, for instance a quench could live outside the door yet be easy to acceess. I have a wooden work bench opposite the smithy with a vice but only use it on dry days. Hammer supplies the force, the anvil resists it, the more force the hammer can deliver the more the anvil can resist, if it's big enough. Only then will the metal deform under the force of the blow. The anvil and hammer only need to be suficient to do the work required, but bigger hammers and anvis can do more work when needed. 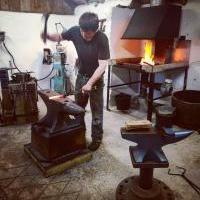 My 'Smithy' is 6x8', From my seated position I can pump the bellows tend the fire and forge on the anvils.....which is just as well as there is no spare room to move! 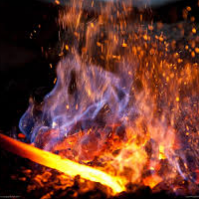 From your post above, you do not have, have not made a forge. It's a foundry furnace and I suspect it to be something like a Gngery Charcoal Foundry Furnace. Look it up on the internet or by his book for full information. An assortment of steel bar stock followed me home courtesy of ID. just got to decied what to earmark it for now! I moved the shop, well the forge, anvil and stand......from the demo field back home to ID's 'Emporium of Wonders and Fantasmagoria'. Find a bit of heafty plate or similar to make a 'saddle' to sit atop your anvil and cut a square hardy hole in it, Sit it over the existing replacement hole and the jobs a goodoun, it will double as a cutting plate or you can even drill a series of holes in it to use it as a bolster for punching holes. Das, When I'm helping ID on his stand, I spend the first hour selling these and the rest of the weekend telling folks we've sold out. very, very popular item. That would be my aproach Frosty, you can send them off in small groups to accomplush part of the task, one collecting fire wood, a group supplied with a magnet to source steel and another with a spade an a bucket for water to dig and form the hole in the ground forge...(kids won't mind bending down half the day to reach the forge) etc....I'd supply them with some starter kit to ensure a tleast some success. I'd go with charcoal, for the simple reason it gives you the widest option of blower types, you could buy or make any version of what we think of as the traditional bellows or nake a chinease box bellows. In fact makig the bellows could be a good initial project for the scouts.....you just need all the bits handy! Just about most other form of air mover you can come up with will or can be made to work, and with charcoal you can turn it off when there's no iron in the fire saving battery life, that may well be all too short in the first place. If you can get manual bellow the scouts can take short turns on it..... it'll be along time before you run out ot scouts! Something tells me I should recognise that, it's not a fly press stand is it?